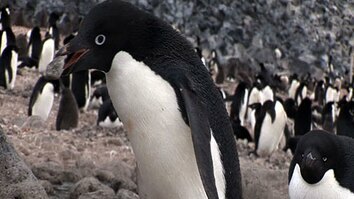 Follow a sprint for survival as a gentoo penguin tries to outrun a hungry southern sea lion. Normally southern sea lions prefer prey like fish, and squid…similar to the gentoos…but in these waters, the hunter becomes the hunted. The sea lion sets his sights on one unlucky bird. He follows in hot pursuit, as the penguin flaps for shore. 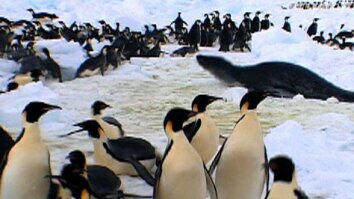 The penguin makes it…with the sea lion hot on its trail. A southern sea lion male—known as a bull—can grow to be over 8 feet long and weigh as much as 750 pounds. Though they usually hunt in the water, they are more than capable of pursuing prey on land—reaching speeds of up to 20 miles per hour. And while the penguin makes a valiant attempt to escape, it proves no match for the giant sea lion. After killing the bird, the sea lion returns to the water to eat his meal. Giant petrels are scavenging seabirds, known for their love of carrion and cast-offs. They show up in droves to take advantage of the sea lion’s less than tidy table manners. 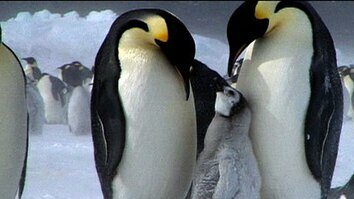 While the penguin met an undignified end, for the sea lion and petrels, this hunt has been a great success.